Linda Parker UK Independent Stampin' Up! 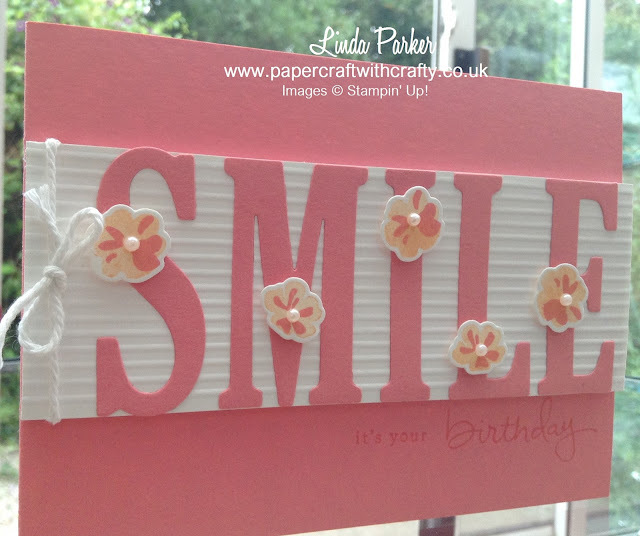 Demonstrator from Hampshire @ Papercraft With Crafty : Smile ! I absolutely love my Large Letters Framelits Dies. They offer me versatility in personalising cards and also creating punchy sentiments. I had a birthday card to make in a hurry and came up with this design. It was quick and easy. The central white scored panel has been adhered using Stampin' Up! 's new Foam Strips, so it is raised, giving the card lots of texture. The gorgeous little flowers are part of the gorgeous Jar of Love Bundle, stamped in Peek-a-Boo Peach and Flirty Flamingo. Firty Flamingo card stock forms the base of the card. 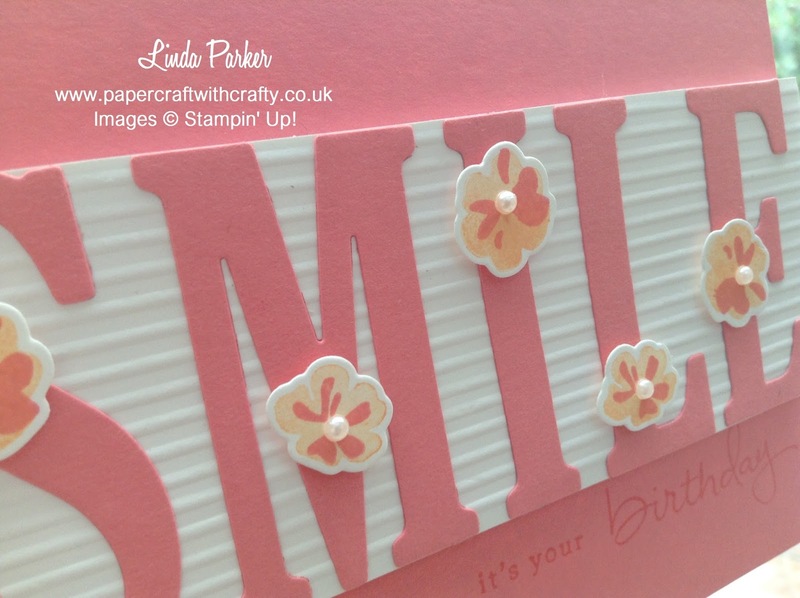 The sentiment is from the very versatile Endless Birthday Wishes stamp set. This has many separate words and allows you to make up your own appropriate sentiment. Inside I have stamped "Have A Lovely Day". So I would say this a great little stamp set as you can create lots of different birthday messages. Finished with some thick White Bakers Twine - I like the contemporary look of this card. Come back and visit me next week, when I can share the fabulous card I have made for my lovely son's birthday using the Large Letters Framelits Dies. I do hope you like my card and thank you for stopping by today. Gorgeous Linda, love the design. Sh sh sh Shaker Card !